Power is now being generated from the final phase of Walney Extension Offshore Wind Farm, which will become the world’s largest offshore wind farm on completion later this year. The wind farm, which is a shared-ownerships project between Ørsted (50%) and two leading Danish pension funds PFA (25%) and PKA (25%), is due for completion in the second half of 2018. 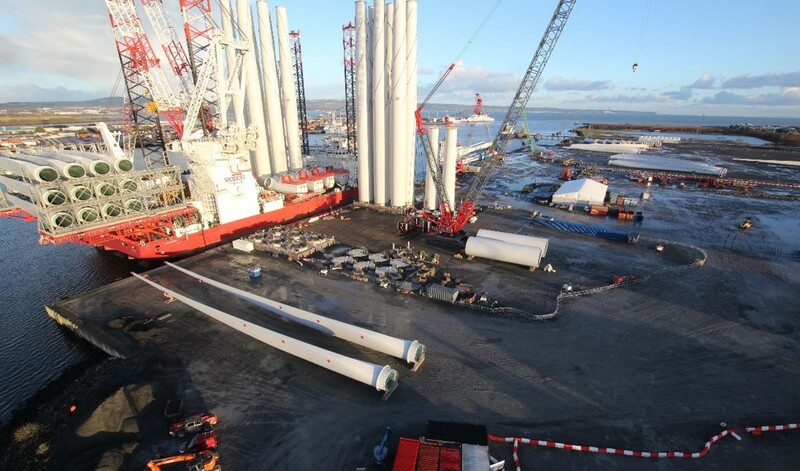 Walney Extension, off the coast of Cumbria, England, is being constructed in two phases using turbine technology from two different manufacturers – Siemens Gamesa and MHI Vestas. The first three of 47 Siemens Gamesa 7MW turbines have now been installed in the second and final phase of construction. This will be the first time the 7MW Siemens Gamesa turbines have been used commercially anywhere in the world. MHI Vestas has already installed the first phase with 40 of its 8MW turbines and commissioning is now nearing completion. Once fully complete, Walney Extension will be capable of generating enough green energy to meet the annual needs of more than half a million UK homes. At 659MW, the Walney Extension project will leapfrog London Array to become the world’s largest operational wind farm. Construction of the project is being co-ordinated from a base at the Port of Barrow, which already hosts the operating and maintenance teams for three other Ørsted offshore windfarms, Barrow, Walney and West of Duddon Sands.